I inherited a small plastic bucket of costume jewelry from my grandmother this was 12 yrs ago. 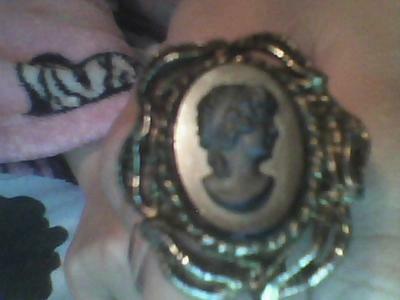 Today I decided to look in it and found this ring which I know is a cameo because you know they have pitures of pretty women on them. I don't know anything about it - there are no markings on it. It looks like the background is glass or a mirror as I can see my reflection; the woman is carved in some sort of black stone, her hair is an up-do, lots of curls and a tendril hanging down the neck with a headband. She has a small pixie like nose. The ring is adjustable. Please help me, I have looked EVERYWHERE and can find nothing like, it.